According to Surat-Shaan, a transgender Jewish man, visibility is not enough anymore and never was enough for some trans and gender nonconforming people of faith. Transgender Day of Visibility (TDOV) aims to bring attention to the accomplishments of trans people around the globe, while fighting transphobia and cissexism. Many in the wider Jewish community will have heard of Transgender Day of Remembrance, but TDOV is very different – it’s not a day for mourning, but one of empowerment and celebration. This year’s day has the theme and hashtag #MoreThanVisibility – with a call to use visibility as a vital tool for justice. But how does this theme resonate with trans people of faith? Has being more visible helped trans Jews, like me, in the UK and worldwide? In the past two years we have certainly seen increased global coverage of trans issues in the mainstream media, and celebrity coming out stories a la Caitlyn Jenner. Visibility has certainly has had the effect that most people nowadays would have come across the word transgender. It helps. But does it help everyone? And has this ‘mainstreaming’ made things better overall? Amazon’s Emmy Award-winning programme Transparent – about a Jewish family coming to terms with their father’s decision to transition – has perhaps allowed viewers to develop a greater understanding of the transgender experience in a faith context. 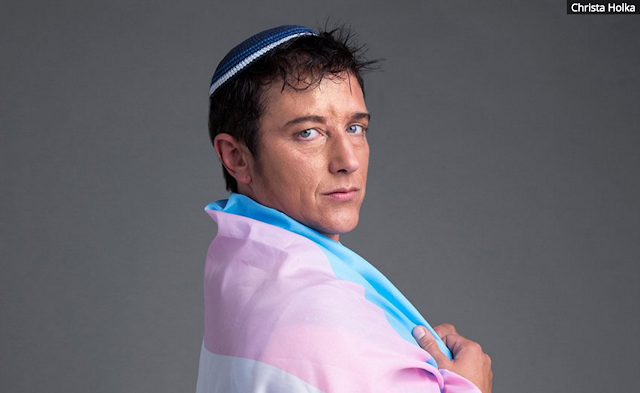 But, despite all of this, many trans and gender nonconforming Jews have experienced first-hand that visibility is not enough. Personally, I am probably one of the trans Jews who is blessed enough to benefit from certain privileges. I am an out and proud Progressive Jew, and international LGBTQI campaigner with my latest project being Twilight People, the UK’s landmark multi-faith heritage project exploring gender & faith beyond the binary, which is hosted by Liberal Judaism. My family, friends, work place and faith community are supportive. I don’t mind my picture and story being out there – as long as I am portrayed in a respectful and authentic way, of course. So far, I have been lucky and it’s been a positive journey for me. Yet, some participants in Twilight People had to remain anonymous. Others did not take part at all, fearing reprisal from their religious community and family. Not all branches of Judaism, or indeed all faiths, are as welcoming as Liberal Judaism. A friend of mine, a British trans woman who came out after a long struggle within her ultra-Orthodox Charedi community, told me: “The government should demand that every school be exposed to [trans issues]. I’ve had to spend countless hours explaining to Charedi Jews that this [being trans] is not a choice, it’s real. “I have not seen my kids for so long – the court system is too slow. I have received death threats and so have my friends. These threats are made indirectly, so the police are not interested in dealing with them as a result. It really seems, that visibility is not enough anymore and never was enough for some trans and gender nonconforming people of faith. I believe we now need better education around trans issues, improved legislation, especially when it comes to dealing with hate crime. I am excited to be working alongside groups like Stonewall and on projects such as Twilight People, and hopefully beginning to change hearts and minds in the more conservative faith communities. Surat-Shaan Knan works for Liberal Judaism and runs the Twilight People project. He is a member of the Stonewall Trans Advisory Group. The International Network for Transgenders with a Jewish Background is a network for transgenders, FtM, MtF and ally with a Jewish background. We share information on transgender and judaism and information about transgender friendly jewish organizations. Advice for Rabbis: when a Transgender Person Comes Out.